St. Nikolai Velimirovich: . . . A mother’s love cannot separate her dead children from those living . . .
Death has one characteristic in common with love: it, like love, works a profound change in many that experience it and go on living. A mother after a funeral goes to the graves of her children. Who goes there? The children in the mother’s soul, with the mother, go to their graves. In a mother’s soul, the mother lives only in one little corner; all the rest is a palace for the souls of the children taken from her. So it is with Christ, though to an immeasurably greater extent. He submitted to the confines of the grave so that men, His children, should know the spaciousness of the limitless palace of Paradise. A mother goes to the graves of her children, as though to raise them to life in her soul, to redeem them by her tears, to have compassion on them by her thoughts. A mother’s love saves her children from disappearance and annihilation in this world, at least for a time. 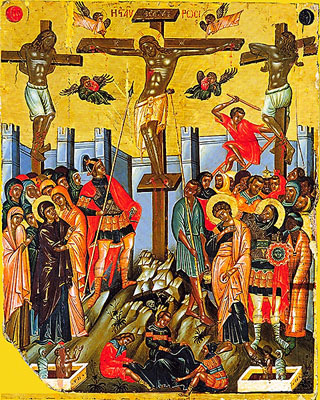 The Lord, humiliated and spat upon, succeeded, through bowing to His Cross and Tomb, in truly raising the whole human race by His love, and saving it forever from vanishing away and being annihilated. Christ’s act is incomparably greater than the act of any lonely mother in the world, His love for the human race being immeasurably greater than the love of any mother in the world for her children. Although a mother, out of her great love and sorrow, always has tears to shed, she takes her remaining tears with her when she herself goes down into the grave. The Lord Jesus, though, shed all His tears for His children, to the last drop – and all His blood to the last drop. Never, O sinner, will more precious tears be shed for you, neither living nor dead. Never will a mother, or wife, or children, or homeland, pay more for you than Christ the Saviour paid. O poor and lonely man – do not say: who will mourn for me when I die? Who will weep over my dead body? Lo, the Lord Christ has mourned for you and wept over you, both in life and in death, more whole-heartedly than your mother would for you. It is not fitting to call those dead for whom Christ, in His love, suffered and died. They are alive in the living Lord. We shall all know this clearly when the Lord visits the graveyard of this world for the last time, and the trumpets sound. A mother’s love cannot separate her dead children from those living. Still less can Christ’s love. The Lord is more discerning than the sun: He sees the approaching end of those still alive on earth, and sees the beginning of life for those who have entered into rest. For Him who created the earth from nothing, and man’s body from the earth, there is no difference between the earth’s, or his body’s, being a man’s grave. Grain lying in the field or stored in a granary – what difference does this make to the householder, who is thinking in both cases of the grain, and not of the straw or the granary? Whether men are in the body or in the earth – what difference does this make to the Householder of men’s souls? Coming on earth, the Lord paid two visits to men: the first to those living in the grave of the body and the second to those in the grave of the earth. He died in order to visit His dead children. Ah, how very truly a mother dies when she goes to the graves of her children! This entry was posted in Sayings from Saints, Elders, and Fathers, St. Nikolai Velimirovich and tagged Body, Body and Soul, Caring for the Dead, Crucifixion, Death, Divine Love, God of the Living, Grief, Harrowing of Hell, Humiliation, Humility, Love, Love of God, Love of Others, Motherhood, Mourning, Ontological Change, Paradise, Parents, Resurrection, Second Coming, Sorrow, Soul, Tears on April 30, 2015 by ocqadmin. St. John Maximovitch: . . . The faith of the thief, born of his esteem for Christ’s moral greatness, proved stronger than the faith of the Apostles . . . The Apostles wavered in their faith in Jesus as the Messiah, because they anticipated and desired to see in Him an earthly king, in whose kingdom they could sit at the right and the left hand of the Lord. The thief understood that the Kingdom of Jesus of Nazareth, despised and given over to a shameful death, was not of this world. And it was precisely this Kingdom that the thief now sought: the gates of earthly life were closing after him; opening before him was eternity. He had settled his accounts with life on earth, and now he thought of life eternal. And here, at the threshold of eternity, he began to understand the vanity of earthly glory and earthly kingdoms. He recognized that greatness consists in righteousness, and in the righteous, blamelessly tortured Jesus he saw the King of Righteousness. The thief did not ask Him for glory in an earthly kingdom but for the salvation of his soul. The faith of the thief, born of his esteem for Christ’s moral greatness, proved stronger than the faith of the Apostles, who although captivated by the loftiness of Christ’s teaching, based their faith to a still greater extent on the signs and wonders He wrought. Now there was no miraculous deliverance of Christ from His enemies — and the Apostles’ faith was shaken. But the patience He exhibited, His absolute forgiveness, and the faith that His Heavenly Father heard Him so clearly, indicated Jesus’ righteousness, His moral superiority, that one seeking spiritual and moral rebirth could not be shaken. And this is precisely what the thief, aware of the depth of his fall, craved. He did not ask to sit at the right or the left hand of Christ in His Kingdom, but, conscious of his unworthiness, he asked in humility simply that he be remembered in His Kingdom, that he he be given even the lowest place. This entry was posted in St. John of Shanghai and San Francisco and tagged Apostles, Crucifixion, Death, Earthly Kingdom, Faith, Falling Down Getting Up, Forgiveness, Humiliation, Humility, King, Meditation on Death, Morals, Patience, Righteousness, Salvation, Spiritual Waking, Wise Thief on April 2, 2015 by . St. Maximos the Confessor: When you are insulted by someone or humiliated . . . This entry was posted in Sayings from Saints, Elders, and Fathers, St. Maximos the Confessor and tagged Anger, Hatred, Humiliation, Insult, Love, Loving Enemies, Quotes from the Philokalia, Thoughts on November 19, 2013 by . St. Mark the Ascetic: Each time someone accepts humiliation . . . This entry was posted in Sayings from Saints, Elders, and Fathers, St. Mark the Ascetic (St. Mark the Monk) and tagged Humiliation, Kingdom of Heaven, Truth on October 31, 2013 by .